Mmmm, almonds and fish - a great snack for when you just need something to crunch on. 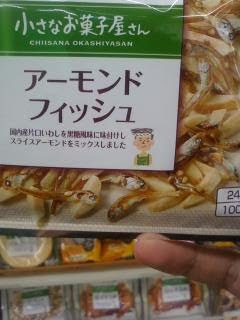 I've sampled a lot of stuff for my Japanese snack reviews blog, but I will never eat these dried fish things. I know that they're going to be awful for someone like me who doesn't eat fish anyway. That being said, they're intact and their bones, guts, eyeballs, etc. are all there and that just really grosses me out! mega coincidence, dude. They totally served those to us for school lunch today. They do make for a great cat toy, however. Let's enjoy Japanese: Do it up! Exciting as watching a...hole in the wall? But why is she so upset?